Shire horses are known as gentle giants, but their skill as sport horses isn’t as widely known. They can be talented at dressage and driving, but did you know they can jump? When this photo flashed across the Shire Horse Society Australia Facebook page, we had to find out what was going on! Robyn Chapman owns the striking 5-year-old, 17.3-hand black gelding Darkmoor Jackson (Oakridge Speculator—Wyee Jessica, Trelow Father Abraham). Chapman’s had “Jack” since he was 18 months old. “He’s a very willing and bold horse early in his training [and] is a much loved member of our herd,” she said. 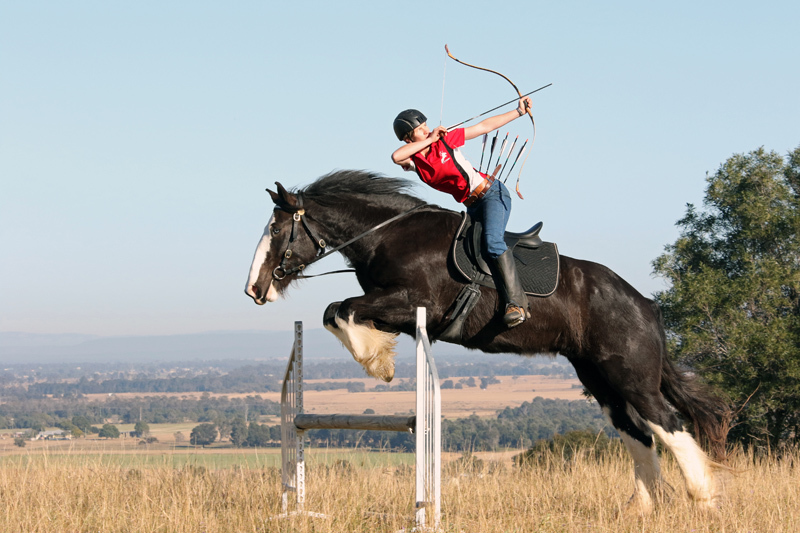 Riding Jack is Adriana Della Franca, a skilled horse archer who has a long list of titles to her name including three-time Australian national champion, five-time West Australia State champion and three-time World Horse Archery Federation world championship gold medalist. The photo was taken at Chapman’s farm, Belleview Shire Horse Stud, in Tarampa, Queensland, Australia, looking west to Toowoomba, which is on the edge of the Great Dividing Range. The farm is about an hour from Brisbane. Jack was prepping for a ridden show, and it was only his fourth time jumping, but Chapman and Franca wanted to have some fun. Chapman, 37, said Jack is very much point-and-shoot when it comes to jumping. Chapman has owned Shires for about eight years and started her stud five years ago. She and her husband, Drew Chapman, were looking for a versatile breed with a kind temperament. Their aim is to produce conformationally correct horses with good temperaments and trainability to allow them to take on any discipline. They have 12 Shires on the farm now, ranging from stallions, broodmares, geldings and foals, and they breed about three foals per year. Behind The Photo: Eek! A Jump!